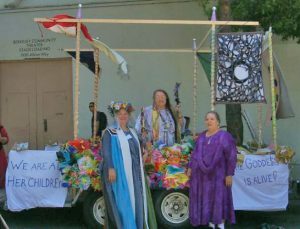 The Fellowship of the Spiral Path (also known as “Spiral”) is a non-profit religious corporation registered under the laws of the State of California. We are an association of neo-pagan groups in Northern California that acknowledge that we share traditions, beliefs, and/or lines of descent in the Old Religion (including but not limited to reconstructed European traditions, Earth religion, and Goddess religion). We have joined together for purposes of inspiration, mutual solidarity, support, and protection. Our purpose is to provide religious and spiritual services to the community, sponsor special interest groups and projects, and encourage diversity of religious expression. We are supported by donations from those who participate in our activities and benefit from our services. The spiral is one of the oldest and most universal of religious symbols. It represents the continuing dance of life inward to the source of all religion and outward to the world of manifestation. Our intention is not to reject the religious evolution of the past two thousand years, but to balance it by recovering perspectives and approaches to worship that have been ignored, suppressed, or forgotten. The Fellowship has no official creed. The only requirement for participation in our services is an open mind. However those of us who participate in Fellowship activities regularly do tend to share certain assumptions. These include the ideas that there is a Divine Power, that this power manifests through both female and male deities, and that it can be contacted both through individual inspiration and formal ritual. We also believe that the physical and spiritual worlds are connected, and that both are holy. In the twentieth century the environmental and feminist movements started people looking for theologies that value the earth for its own sake, and honor the Goddess as well as God. Working together, they sought to recover the interrupted Native European traditions and to explore new ways of worship. Many of these groups follow the old earth religion of Wicca and call themselves witches, while others use the techniques of ceremonial magic, shamanism or work to reconstruct the practice of a specific cultural tradition such as Greek or Germanic. In 1981 the Center for Non-Traditional Religion was founded in Berkeley to host a variety of alternative religious groups and activities. In l986 the CNTR was reorganized as the Fellowship of the Spiral Path, a new tradition of the Old Religion, sponsoring worship and other activities for both women and men. For the full story, see History. The Fellowship is governed by an Executive Board and by representatives from its circles. This Joint Board meets quarterly to admit new member circles, and to make decisions regarding Spiral policies and projects. Officers are elected by the members at Midsummer. Our Operating Procedures are posted under Organization. Affiliated Groups Links to groups affiliated with the Fellowship of the Spiral Path. Organization Details about Spiral’s organization, such as its bylaws. Collegium The Collegium is Spiral’s Clergy Training Program. Find out more about it here! have written and made available to the public. The Fellowship sponsors many groups and activities, mostly in the East Bay region of the San Francisco Bay Area, though some events may take place in the Sacramento area, South Bay, or Lake County, California. These include circles, classes, study groups, regular worship and special events. Some meetings are open while others are by invitation only. The best way to get involved is to meet us at one of our open events. For a current list and contact information on what we are doing, contact us. The Fellowship publishes a newsletter which appears after each quarterly Board meeting. Information for the newsletter should be sent to our contact form. A membership/subscription for one year is $7.00 – $21.00 (sliding scale), sent to PO Box 5701, Berkeley, CA 94705-0701. Membership runs from Summer Solstice to Summer Solstice. For additional information, contact us. Spiral has several e-mail lists to announce and discuss topics and events of interest to the organization. For more information, contact us.